Are you interested in having your wedding held on Amelia Island? Are you going to be in Amelia city or Fernandina Beach Florida? 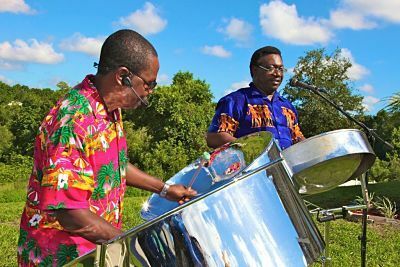 A great addition to your wedding ceremony, corporate event, or even a fundraiser is great music, the RythmTrail Steel drum band has a unique sound that can grab the attention of even the most creative and fun loving people. It has an eclectic sound with a hint of reggae music, perfect for beach events, weddings, or even corporate gatherings. If you are looking to attending an event in Amelia Florida, and need a different sound the RythmTrail Steel Drum Band has what you want to hear. If you are joining the Amelia Island Summer Beach resort with the intent of visiting Ocean Place, or even the Sea Watch you can add to your evening with a touch of Steel drum music. The perfect sound to accompany you at your beach wedding ceremony or rehearsal dinner is the steel drum players. As a group or single steel drum players their experience of over 20 years can bring you the sound you need. Their music catches the attention of everyone who can hear them. It will make your special evening the center of attention this year. Playing at house parties you can enjoy their music in a large setting or even a small gathering. For those of you who don’t know what steel drum music sounds like this is a great way to gain exposure to a new style of music. With sandy beaches, relaxation, and even mingling spirits entertaining with the steel drum players will make the event shine brighter. If you love listening to Calypso music, Reggae, Soca take a chance and put that smile on your guests face. If you want the steel drum band to play at your wedding ceremony, wedding rehearsal, corporate event, or even corporate fundraiser give them a call now Tel 866 495 4522 or click here for a fee quote. Fernandina Beach, Black Hammock Island, Little Talbot Island & Fort George Island Florida. Atlantic Beach, Neptune Beach, Jacksonville Beach, Ponte Vedra Beach, Sawgrass, Palm Valley and Vilano Beach Florida. Jammin at a corporate reception tonight on the beach in Amelia Island FL. Book the best steel drum players in Fernandina Beach.